From the Old Town Square walk along Dlouha street for 100 metres. At the small roundabout, bear slightly to the left to enter Kozi street. Kozicka is located 20 metres along on the left-hand side. Kozicka (Little Goat) in Prague is a bustling cellar bar near the Old Town Square, popular with local Czechs, and foreigners in the know - it is not easy to stumble upon! From a small entrance at street level, you descend into a large winding stretch of bar areas linked by exposed-brick archways. The beer is cheap for the centre of Prague, and served in glasses up to one litre in size. There is also a selection of wines and spirits on offer. 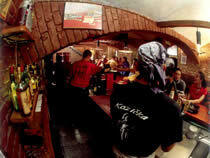 Kozicka has an authentic friendly feel, and as you are down in a cellar it is quite easy to lose track of time. The bar attracts people of all generations, from traditionalists to the young and trendy crowd. It is mainly populated by Czechs, but tourists are very welcome to soak up the atmosphere. And groups will find that Kozicka has plenty of room to spread out. You may enter for just one drink as you journey around the city at night, but find you actually stay for several more! For a bar near Wenceslas Square with a similar feel try U Provaznice Pub.